Some of our customers pay our products the nicest complements. The Avantgarde Duos below are most unique acoustically and visually. 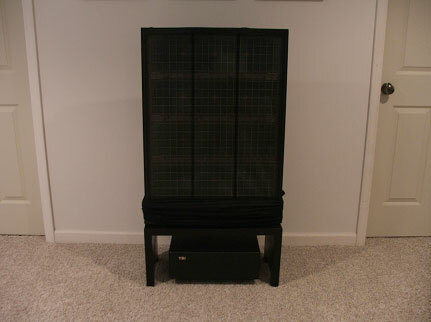 The owner has designed a new stand system to include a nice place on the floor for his TBI Magellan VIP subwoofers. The Duo's factory sub system houses two 10" drivers in a much larger enclosure that are actually a part of the horn mounting stand. 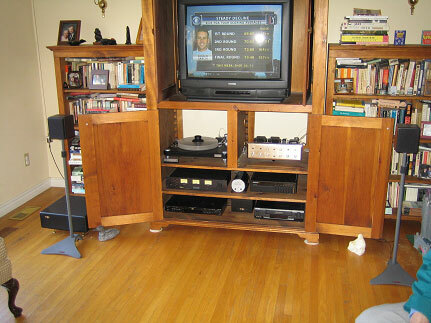 This proved to be a part of the problem solved by this clever audiophile. The vibrations cause micro motion of the horn assembly already almost motionless in executing the wave. 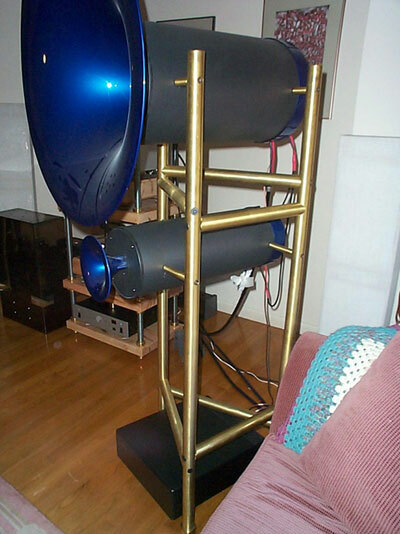 The custom designed brass stands are strong and beautiful and don't have two mammoth 10" drivers vibrating the assembly. The other part of the solution involved replacing the factory sub with a single 6" Magellan VIP which keeps up with the micro motion of the horn diaphragms and with little vibration and not being attached there is no modulation of the horn assembly. The Magellan VIP is replacing a larger cabinet with two 10" drivers and providing a musically natural bass performance. We are not talking about 85db sensitive mini-monitors here we have straight horns with a 104db sensitivity providing no bass below 150Hz. What this illustrates is that the efficiency is not the problem when it comes to producing refined musical bass. The efficiency is caused by operating the drivers at and near free air resonance. This obscures detail yet even in this day and age of lightning fast mains the industry is only familiar with this method of producing the low frequencies. The Avantgarde Duos drivers aren't focusing on their free air resonance frequency to obtain the high efficiency that it has, the designers avoid that range with a vengeance. TBI Bass Extension Modules™ operate on a very similar principle in that high mass and a low resonance frequency are avoided as surely as if it was a midrange or tweeter driver. In fact the raw specs of our drivers would not even hint to their use as a subwoofer driver but our science makes it the perfect low frequency transducer. 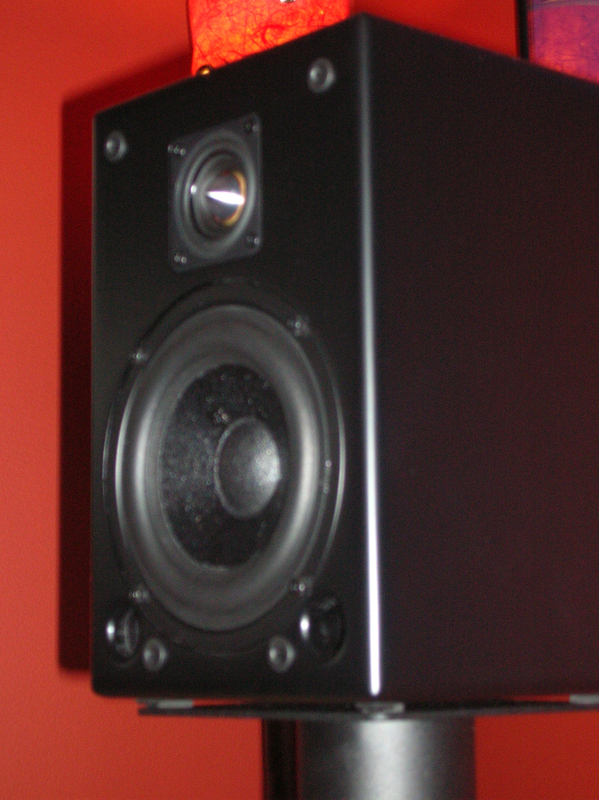 It is really a new day for the audiophile and the subwoofer. 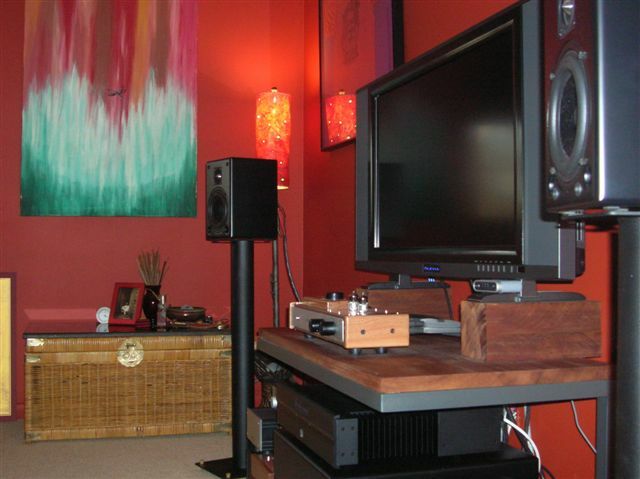 The Magellan VIII xu pair in this picture are perfect mates for the Avantgarde Duo's replacing the dual ten inch subwoofers that accompany this high sensitivity audiophile system. Two eight inch drivers in amplifier sized enclosures are replacing 4 ten inch drivers in large boxes while providing perfect integration, a lower bass extension and matching the acoustic output of the horns. 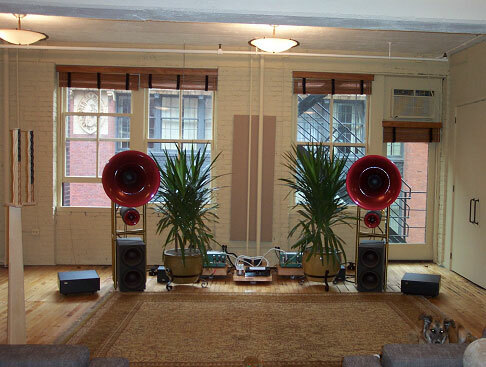 This is no small room and the speakers are amongst the worlds most sensitive audiophile loudspeakers. While sensitivity is an issue for the Magellan's its not quantity but quality that wins because added resonance at any level cannot be concealed or accepted in an audiophile system. The stock subs are a physical part of the stand for the brass horn support tubing and cannot be removed without a redesign. The Quad electrostatic is one of the most respected and sought after audiophile speakers in existence and with the recent comeback of the Quad line it is more important to bring them into the new millennium with bass extension that perfectly compliments their musicality. The system above uses Model 988s modified to the extreme current spec complimented by the most natural bass extension on the planet. The Magellan VIII su integrates naturally using a simple yet exotic technology to usher in the lows. No subwoofer look here and you won't be able to notice its audible location either as acoustically they become one source, that of the panels. 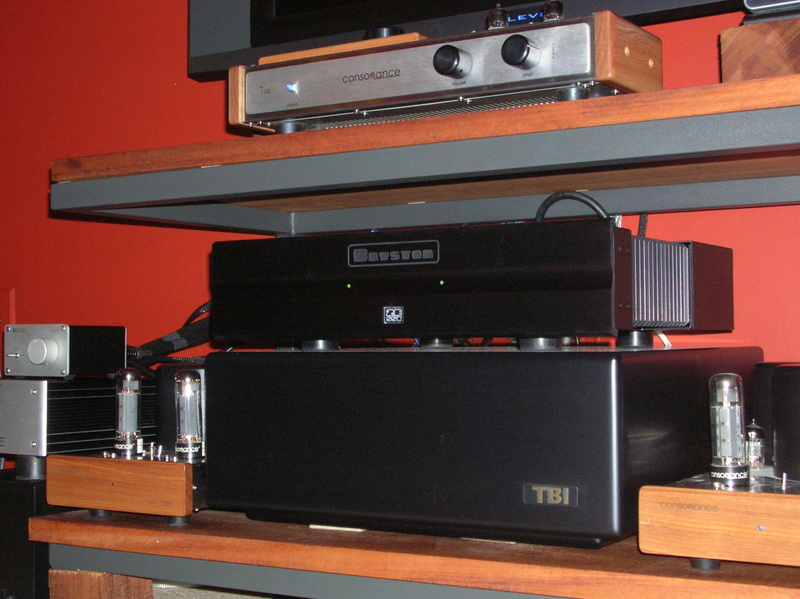 Read the Quad/TBI reviews linked from our press page to read words from audiophiles illustrating the natural relationships that exists here. T. Reece - High End Audio Video System with Majestic Diamond II audio monitors, the Magellan VIII su and TBI 200 su amplifier.